(2 p.m. EDT) -- Tauck will run a family-friendly river cruise on Portugal's Douro River, as well as two other sailings, when the luxury tour company launches its brand-new ship in 2020. Tauck's new ship, ms Andorinha, will have 84 passengers -- fewer than other vessels that currently ply the Douro. The 42 cabins onboard will include 12 300-square-foot suites on the upper deck and 20 225-square-foot suites on the mid-level deck. The remaining cabins on the lower level are 200 square-feet and 150 square feet. The ship will also have the second casual dining venue, Arthur's, found on the line's other European vessels. 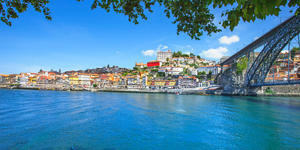 Villages & Vintages, Cruising the Douro Valley runs eight days, roundtrip from Porto. Exclusive Tauck activities include a private dinner with wine pairings at the family-run wine estate Quinta do Portal and a port cocktail-making workshop. The cruise runs April through October 2020. Exploring the Douro, Plus Lisbon and Madrid spans a total of 12 nights, with pre- and post-cruise stays at hotels in Lisbon and Madrid. In Lisbon, Tauck guests will take a tour and have a private dinner at Queluz National Palace. The cruise also boasts a special culinary evening at DOC in Folgosa, a Michelin-starred restaurant from chef Rui Paula. It runs April through October 2020. Douro Discovery: A Family River Cruise in Portugal is part of Tauck Bridges, the company's family travel arm. The line says the itinerary is the first family-focused river cruise on the Douro (other river cruise lines, such as CroisiEurope, do allow kids, but the itineraries are not specifically geared toward them). The eight-day trip, which will be held four times in June and July 2020, will begin with two days in Lisbon and spend five days sailing the Douro. Family activities include dinner at the National Palace of Queluz, a choice of a vineyard hike or kayaking on the Douro, and a bike tour through Vinho Verde wine country. Tauck cruises and tours include all shore excursions; gratuities; beer, wine and spirits; airport transfers; and luggage handling. Tauck cruises also employ Tauck program directors, who stay with the trip and give passengers individual attention. On the Bridges trip, a Family Host will coordinate special activities and crafts onboard the ship.